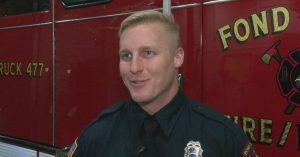 A send off ceremony was held Thursday for a Fond du Lac firefighter-paramedic who is being deployed to Afghanistan. Wisconsin Army National Guard Sergeant Brett Hefty is scheduled to depart this month for his first overseas military deployment. A send off ceremony was held Thursday afternoon at the South Main Street Fire station. “I’ve got this great community, and great bunch of guys and gals that support me in everything I do,” Hefty said. “Even though a long deployment is not what my family wants to hear its something I’m proud to be doing.” Hefty is a four year member of the Wisconsin Army National Guard and has been a firefighter/paramedic for two years. His tour of duty will be for a year.